NETWORK FINALS: Unusually, ABC’s shows didn’t decline after adjustment for NFL preemption. However, THE NEIGHBORHOOD, which had no such excuse, did lose 0.1. In addition, ARROW gained 0.1 in final numbers. CABLE HIGHLIGHTS: ESPN’s MONDAY NIGHT FOOTBALL was at 3.62, up 0.54 from last week’s game. 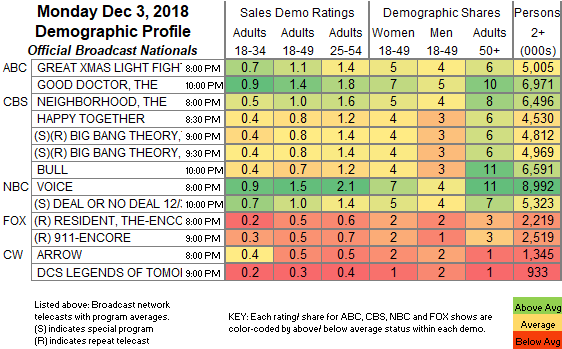 On USA, the WWE telecast was at 0.85/0.83/0.75, compared to last week’s 0.85/0.80/0.73, followed at 11PM by an episode of REAL COUNTRY at 0.24. On VH1, LOVE & HIP-HOP dropped a tenth to 0.84, and TI & TINY was down 0.07 to 0.46. On MTV, TEEN MOM was at 0.54/0.32 compared to last week’s 0.58/0.30. Bravo’s VANDERPUMP RULES returned at 0.53, with the lead-out premiere of UNANCHORED at 0.17. On Food Network, HOLIDAY BAKING CHAMPIONSHIP jumped 0.09 to 0.48, and CHRISTMAS COOKIE CHALLENGE was up 0.02 to 0.33. 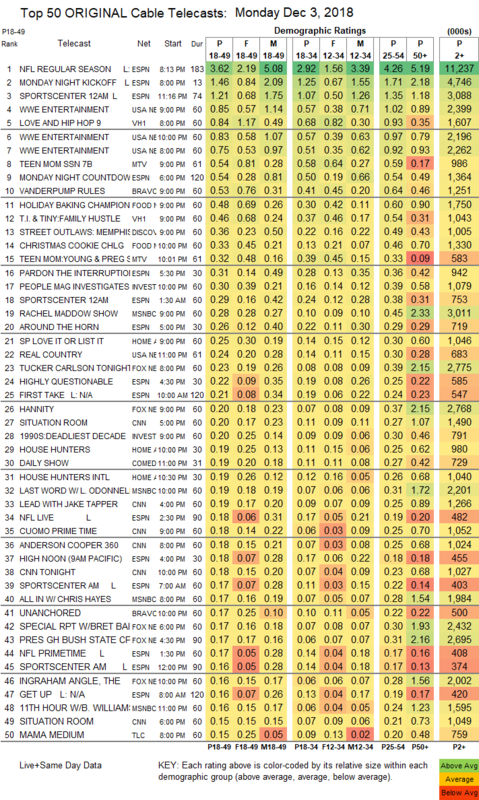 On Discovery, STREET OUTLAWS ticked up to 0.36. On ID, PEOPLE MAGAZINE INVESTIGATES rose 0.06 to 0.30, and DEADLIEST DECADE ticked up to 0.20. MSNBC’s RACHEL MADDOW SHOW led cable news at 0.28/0.45/3M, with Fox News’s HANNITY at 0.20/0.37/2.8M, and CNN’s SITUATION ROOM at 0.20/0.27/1.5M. On HGTV, LOVE IT OR LIST IT slipped 0.02 to 0.25, HOUSE HUNTERS shed 0.03 to 0.19, and HOUSE HUNTERS INTL was up 0.02 to 0.19. On TLC, MAMA MEDIUM gained 0.02 to 0.15, and the season premiere of WHO DO YOU THINK YOU ARE was at 0.14. Syfy’s NIGHTFLYERS held well, down a tick to 0.14 from Sunday’s premiere. HBO’s MY BRILLIANT FRIEND stayed off the chart, but ticked up from last Monday’s episode to 0.03/210K.